In 2010, the Society of American Travel Writers named former Brat-Packer Andrew McCarthy their Travel Journalist of the Year. Apparently McCarthy ventured away from Hollywood and out into the world to embark on his new career as a travel writer. He published his first article in National Geographic Traveler in 2006 and has since had his work appear in The New York Times, The Wall Street Journal, and The Atlantic as well as many more times in National Geographic Traveler. It would be so easy to jump to the conclusion that his famous name is what attracted these publications to publish his work, but if you read his stuff, you’ll see that he’s the real thing. His name may have opened some doors, but the resulting accolades are a result of his writing. 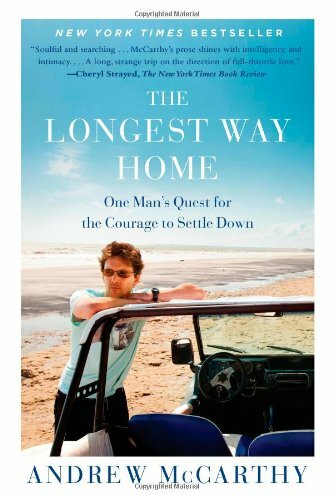 That point-of-view intrigued me enough to pick up his travel memoir The Longest Way Home: One Man’s Quest for the Courage to Settle Down and see how he mixed storytelling with travel writing. I found out immediately. McCarthy’s memoir is a story. It’s the story of a man who is afraid to settle down. It’s the story of a loner who is unsure of his ability to connect completely with another human being. It’s the painfully honest story of a man who is afraid that he won’t be able to live up to other peoples’ expectations. He becomes engaged to “D”, his Irish girlfriend. But as soon as they begin to plan the wedding, he pitches several queries to magazines and gets assignments that will take him away from home, away from wedding preparations, and away from the imminent commitment he is about to make. It sounds selfish and frankly, is selfish, and he admits this. But it is also a part of his personality that he cannot ignore. He needs to travel solo, test his self-reliance and grow. During each of the trips he takes during the year leading up to his wedding, he discovers something new about himself. At home with his solitude, he wonders why he is the way he is, and what shaped him to be that way. He contemplates his relationships with his family growing up versus the relationships that enfold him in his new Irish family. He wonders why he feels easier with them than his own family even as he wonders whether he can really engage in such close-knit relationships. His writing takes us to his destinations and we get to experience those exotic spots in the world, but we also get to wander through McCarthy’s thoughts. He takes us with him on that journey, too. I could relate to so many of his insights about himself and solo travel. Like McCarthy, I’m sometimes overwhelmingly introverted and feel a guilty pleasure when I can roam the world alone. I read McCarthy’s book and wished I could travel along with him. It was easy to see how The Society of American Travel Writers chose him as their Journalist of the Year. He embodies the curious spirit of a nomad, the quest-seeker that so much of travel writing depends upon, and the gifted ability to put his thoughts and feelings onto paper. Travel writers would do well to read both the interview with him in Writer’s Digest and to study his book. Readers will simply enjoy his story. Armchair travelers are in luck; they get the best of both worlds — tales of adventure in far-flung corners of the world, and a trip through McCarthy’s psyche. You’ll have to read The Longest Way Home to see where that particular journey ends. What travel memoirs would you recommend? Bill Bryson! He is so funny, and you’re still learning about the places he visits. Ag, yes. Bill Bryson. Always good. My favorite is ‘A Walk in the Woods.’ I almost decided to hike the Appalachian Trail myself after reading that. Having traveled solo quite a bit myself, I too can relate to this introverted mindset. Very interesting and what a great recommendation! Yes, I definitely identified with his introverted personality. He expressed it very well, too. That’s not easy. What a glorious description of “freedom,” the passage you mentioned. I have never felt anything else like it – glorious. Isn’t that a great description? I could have pulled out so many quotes from his book. The way he feels when he’s traveling is how I feel: free. This book sounds right up my alley. Having become somewhat of a nomad myself these last few years, its definitely given me a new perspective on traveling. Memoirs are not usually something I read (some can feel way too self-indulgent) but this one sounds not only like a good story but also good food for thought. The last memoir I read was Eat Pray Love by Elizabeth Gilbert (I think I mentioned it to you before). Though I had some issues with parts of it, it does provide some interesting things to think about. Memoirs are my favorite genre, so when someone combines that with good storytelling, it’s a winning combination for me. I liked Eat, Pray, Love, though didn’t especially connect with the author. I liked the structure of the book and the journey. Wonderful that he’s found another career away from Hollywood. “One Year Off” by David Cohen was the first travelogue that I ever read. I still remember it to this day. Excellent story about traveling with a family. I haven’t read that one, Lane. I’ll have to find a copy. Thanks for the reco! I’m putting this on my reading list! I agree I prefer to read the stuff with a story in it. But of course it has to be a good story, too – not just a what-I-did-on-my-holidays homework assignment type story from school, and to an extent I prefer it to be a useful story (unless it’s just a really, really compelling/compellingly-told story). Stuff to aspire to! I liked Are You Experienced by William Sutcliffe on student/backpacker travel. That’s another book I’ll have to pick up. Thanks for the reco! I’ve always liked him, too. Too bad I missed that interview. Hope you like the book! You’ve peaked my interest and I’ve ordered the book. Now I need a holiday or some travel, to read it … and The Cage, which I also bought on your recommendation ! I hope you like them. I’m a sucker for man vs. self vs. nature books. What a great review! Thanks for sharing this book, it sounds great! I liked it. He managed to put his feelings about traveling into exactly the right words. Well, good morning! I had no idea he was doing all of this! Just added the book to my Goodreads list. I love thoughtful traveling books, so this sounds like my cup of tea. I know. I feel like this completely missed the Hollywood and literary radar. I’m sure it didn’t, but somehow I missed any news of his foray into writing. I had heard he was a writer, but missed that he had a book. I’m off to add it to my reading list now. Thanks for this really well written review. I know. Wasn’t this description perfect? It’s what I love about being in a car or on a ship, or walking. I don’t usually carry a cell phone, and it’s bliss to be alone and wandering.